In 2018, Stéphane Regnault will release his first single-vineyard cuvée from his family’s prime terroir in Oger and Le Mesnil. Two other cuvées will follow in 2019, and 2020. These bottles are the result of over a decade of reflection, experience, and trials. In In 2007, after working briefly as a sommelier in London and an aerospace engineer in Paris, Stéphane returned to the Côte des Blancs to take over the family domaine. Inspired and influenced by the conversations he had with other young producers, Stéphane decided to stop using herbicides in the vineyards, and gradually converted to organic farming. The domaine includes four hectares of Chardonnay divided equally between the legendary chalk terroirs of the Grand Cru villages Oger and Le Mesnil. The majority of the vines are between 40 and 60 years old. Stéphane has selected three parcels for his cuvées: Chemin de Flavigny in Oger, Moulin on the border between Oger and Le Mesnil, and Hautes-Mottes in Le Mesnil. These single-vineyard, multi-vintage wines harmonize the individual expression of the vineyard within the multivintage Champenois tradition. Each parcel is fermented and vinified in a similar fashion - ⅔ in stainless steel tanks and ⅓ in used barrels. Malolactic fermentation is neither blocked nor encouraged - Stéphane allows the wine to take its course each year, tasting regularly to determine the right moment to blend the barrels and tanks into one of the three perpetual solera that are kept separately for each of the three cuvées. In addition to making wine, Stéphane is a passionate jazz saxophone player, and has named his three cuvées after a different jazz mode that each wine reminds him of. As some of the cuvées require more time in bottle, and with the longterm goal of offering three different wines from different base vintages each year, only the cuvée Lydien from the Chemin de Flavigny parcel will be release in 2018. 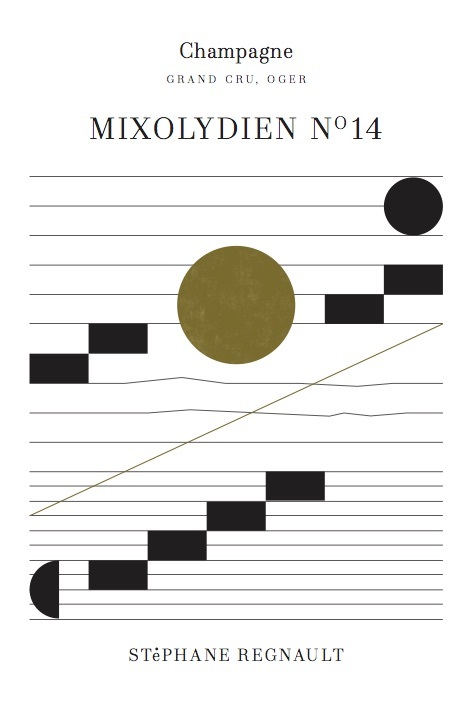 Mixolydien from the lieu-dit Moulin will follow in 2019, and then the cuvée Dorien from Hautes-Mottes in 2020. From vines planted between 1950 and 1980 on light soil with chalk. Hand harvested, fermentation and aging ⅓ in used barrels, and ⅔ in stainless steel tanks. Malolactic fermentation is neither encouraged or blocked - generally occurs in the barrels, but not in the tanks. Bottling in June, and disgorged after a minimum of 30 months. Annual production 1,800 bottles.